One of the many joys in gardening is growing your own seedlings. Pricking out and potting on seedlings are necessary steps in that process. Pricking out, or thinning out, is the term used in the horticultural industry for the first potting of young seedling that are grown in seed trays, flats or any container that the seeds aren’t individually planted. 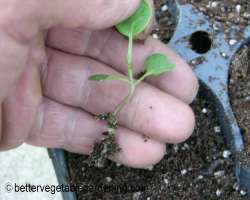 Seedlings need to be pricked out soon after developing their 1st set of true leaves. 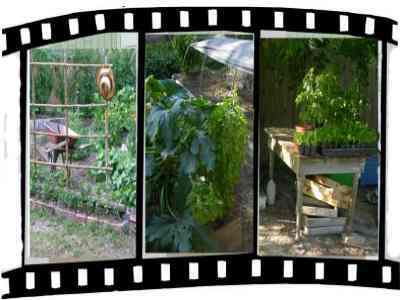 At this time they need more room to grow so it's time to move seedlings to deeper containers or individual pots. The main reason for pricking out , or re-potting seedlings early in their life, is to prevent overcrowding as they grow larger. Overcrowding will cause seedlings to develop into inferior plants with their roots becoming so intertwined that it will prevent safe separation of individual plants. Generally the larger the plant the larger the container, however do not be tempted to prick out into what eventually will be the final pot size. It is best to use a pot size that helps to concentrate moisture and soil around the roots. As they outgrow their container they can then be re-potted again. Container for your potting mix. Pots, cell pack or trays. Plant markers and indelible pen.